In the Great Hall, the emphasis was on bringing out the pure sound of instruments and voices rather than installing a sophisticated sound system. 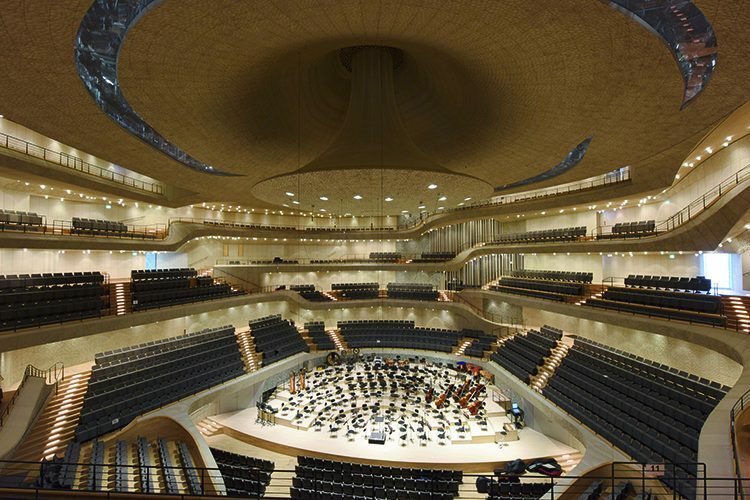 With this in mind, just six Meyer Sound CAL 64 column array loudspeakers were specified and these are housed within a mushroom-shaped reverberator, which is suspended from the ceiling. The large majority of the hall is covered by these six CALs thanks to their beam steering technology, however, there are additional CAL 32 loudspeakers and support loudspeakers in the ceiling to cover the higher seats within the auditorium. 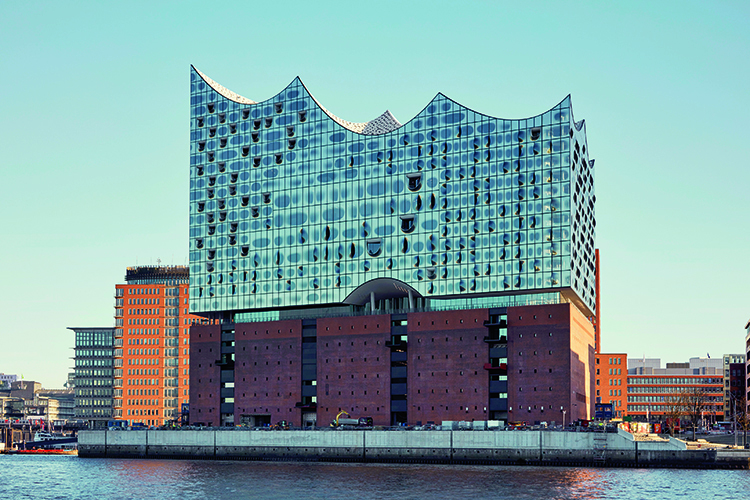 d&b audiotechnik loudspeakers are used for events at NDR radio – which is a close partner of the Elbphilharmonie – so it made sense to specify these loudspeakers for the Recital Hall and the Kaistudio for continuity. To control sound reinforcement in the Great Hall, the Recital Hall and Kaistudio, five Lawo mc²36 digital mixing consoles were supplied and incorporated into the digital audio infrastructure, in a joint effort involving the manufacturer and the NDR – a North German radio and TV broadcaster. Lighting in the Grand Hall is housed on a circular lighting bridge mounted above the stage area. Classic theatrical fixtures from ETC and Robert Juliat were selected and installed behind a series of ceiling cut-outs covered with special glass. ETC Source Four profile spotlights are known for their flexibility in regards to beam angles and radiation characteristics and the Robert Juliat profile spotlights contain 2,000W lamps and are very reliable when it comes to distances up to 30-metres. Additionally, 37 ETC Desire D40 Tungsten LED spotlights were installed as downlights to provide high-intensity, warm-white light with a colour temperature of 3,000K, matching the effect of the ETC and Robert Juliat fixtures. A particular challenge during this project was the construction and assembly of the 32 TV mirror displays distributed in Great Hall. The mirrors are available in three sizes – 90cm, 140cm and 169cm in diameter – and hang on the walls, slightly facing the audience. The TV mirror displays were manufactured by ASC and are equipped with a substructure that allows easy access to the display and to the set-top box, while at the same time, anchors the structures firmly to the wall. The mirrors are circular, 10mm thick glass panes made of ESG, a product called ‘Mirona’ manufactured by SCHOTT. On the back of the glass, a passe-partout was applied as a colour coating by the screen printing process, in order to expose the contours of the behind-the-scenes Panasonic displays. The edges of the glasses have been designed with a C-edge bevel. If the displays are switched off, the mirrors represent a design element; in the switched-on state the displays are visible and serve as an information system. Individual content can be reproduced in the form of text, image or sound. Every stage desk is unique, no project is the same. This makes working in this technical discipline so exciting. 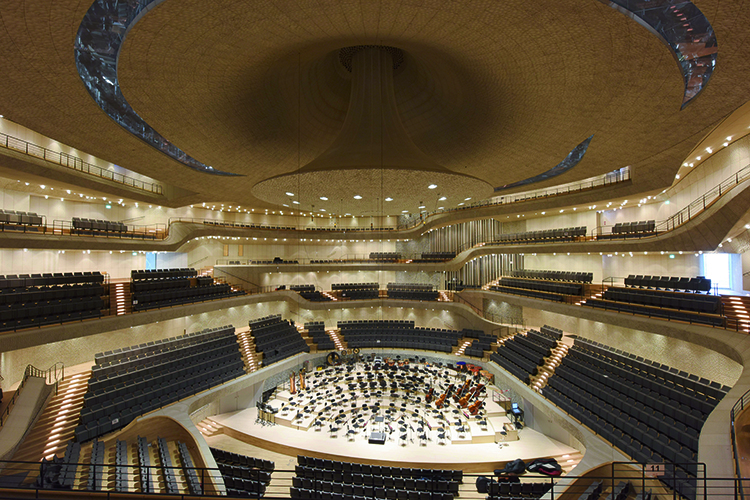 The stage desks in the Elbphilharmonie are custom-made to customer’s request. Over the course of the project, there have been a number of changes to improve the overall system and its usability.